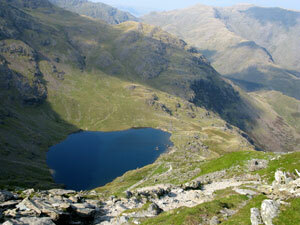 The walk follows a circular route from a parking area on Walna Scar road, near Coniston in the Lake District. 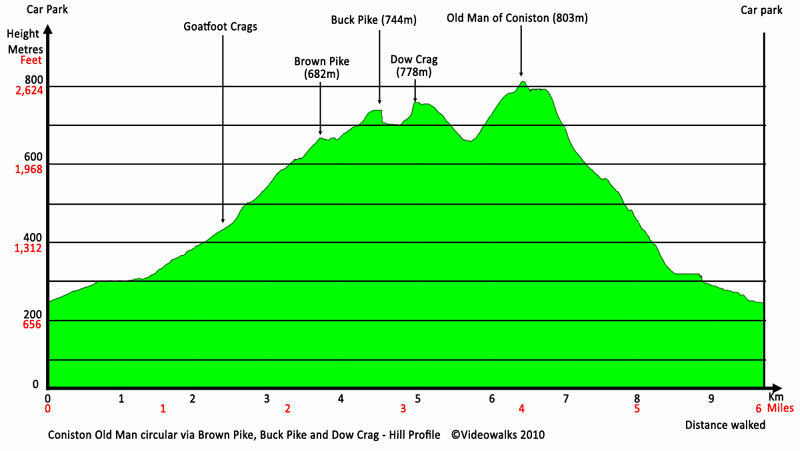 It sets off in a westerly direction along Walna Scar road itself, which is now a track, before turning northwards to start the real climbing over Brown Pike, Buck Pike and Dow Crag. The walk drops down to Goat's Hawse before heading to the summit of the Old Man of Coniston, known by many as Coniston Old Man. From the summit there are excellent panoramic views of all surrounding hills and fells, from Black Combe around to the Pennines taking in the Scafell group to the North and as far as the Isle of Man to the West, along with Blind Tarn and Goat's Water below. From the summit, the walk zig-zags down to Low Water before returning to the parking area through the remains of a bygone era in this part of the Lakes - copper mining. Parking: Parking area approx 1km out of Coniston at the end of the tarmac section of the Walna Scar Road (grid reference SD 288 970). The added bonus - it is free to park! If full, there is plenty of parking back down the road 1km away Coniston. Parking in Coniston will add a further 150m climb to the walk and no real further enjoyment or views! Downloads are available in different resolutions for your PC, SmartPhone and other mobile devices and are provided in mp4 format for maximum compapability with a wmv version also available. You also receive a PDF document with the walk details and an Ordnance Survey map extract that you can print out or view on your mobile device. Watch the video on your PC or burn to a CD or DVD to watch on your TV to see in detail the walk before you set off. Once saved to you device, you can then play them an unlimited number of times whenever you want!